It's important to note that these aren't specific proposals -- they're just ideas about what might be possible someday. Jason King presenting some of the main topics that bubbled up from a public workshop earlier in the week. 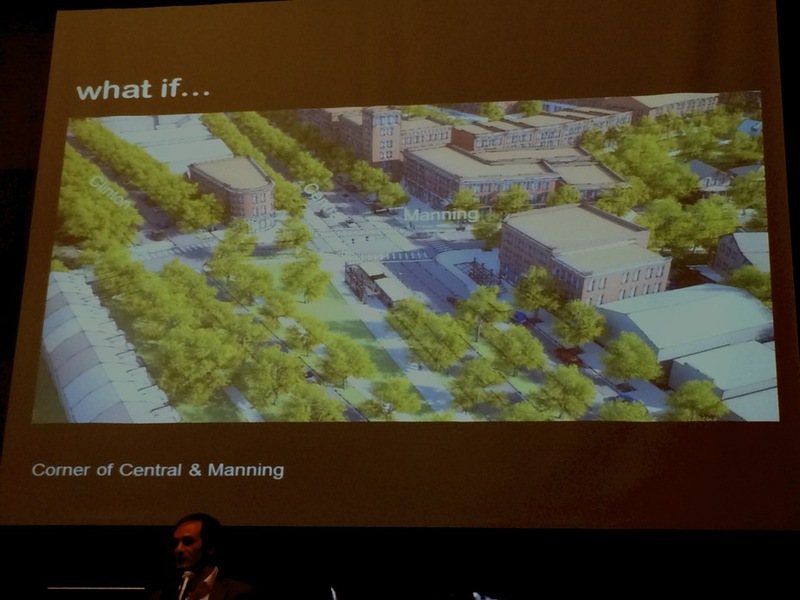 One of the issues frequently mentioned by people in the public workshop was finding a way to make the intersection of Central, Manning, and Clinton work better. 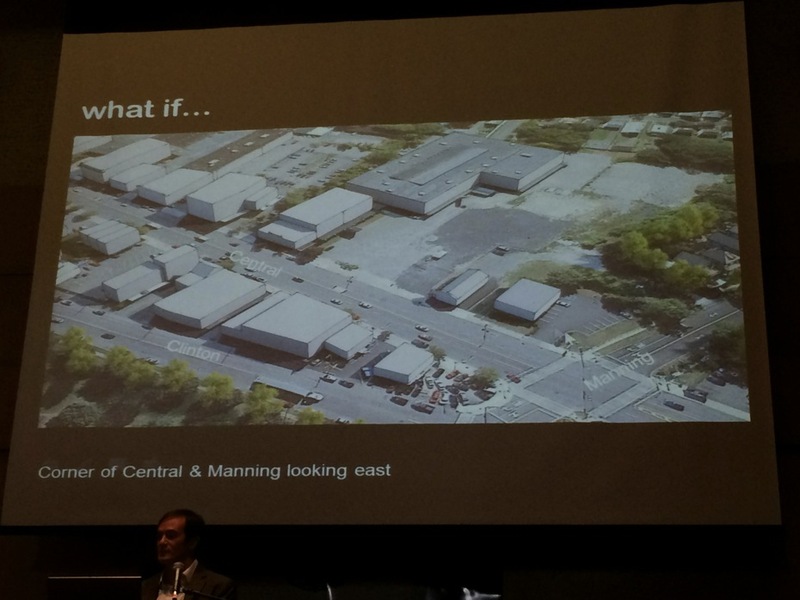 King presented one possibility that would enhance the triangle "square" at the intersection, close off some of the traffic on that short segment of Clinton. After the presentation, King said to us that project is a good candidate for a first step for the corridor, because it's a relatively easy project to both accomplish and land money for it. "A small success like that would build confidence in the larger plan." One of the ideas was to redevelop the Bleecker Terrace apartments so that 1) they connect to the street grid better and 2) offer a mix of unit types so that people can continue to live there even as the size of their families change. 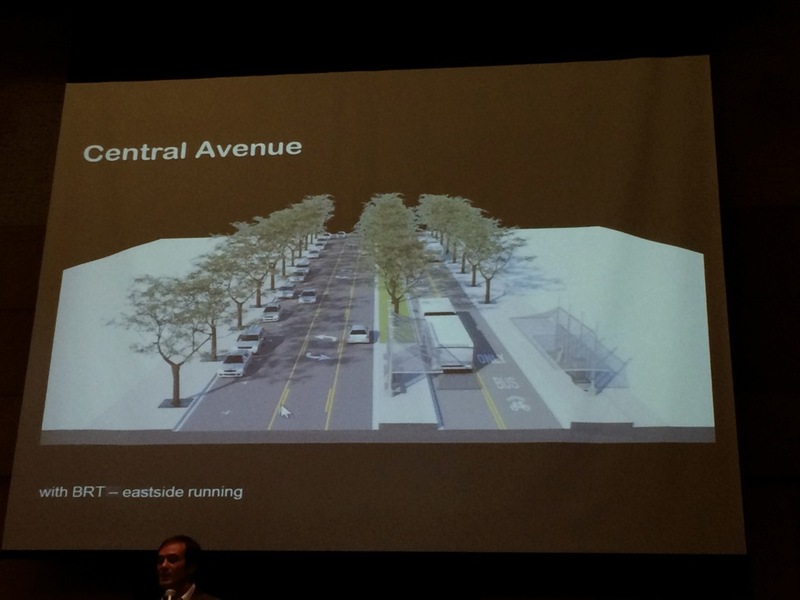 Another issue raised in the public workshop: Doing something to make the actual road on Central Ave a better experience. 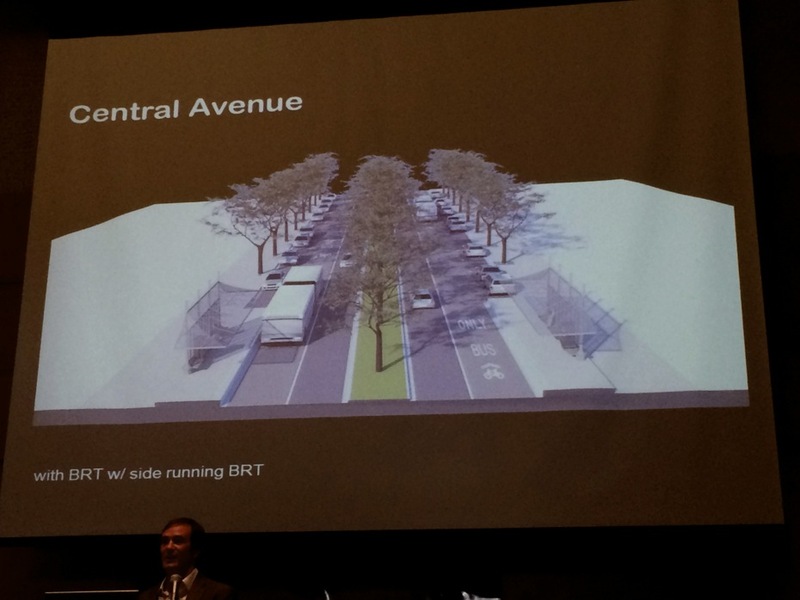 So King presented some possible options -- not too different from the "road diet" ideas being pitched for Madison Ave.
A big component of the potential reconfigurations is highlighting the popular BusPlus line that runs along Route 5. One of the potential advantages of the transit-in-the-center layout, according to King: It leaves open the possibility of maybe someday adding light rail. Some of the visions included the possibility of adding new cross streets in an attempt to open up some of the large parcels. 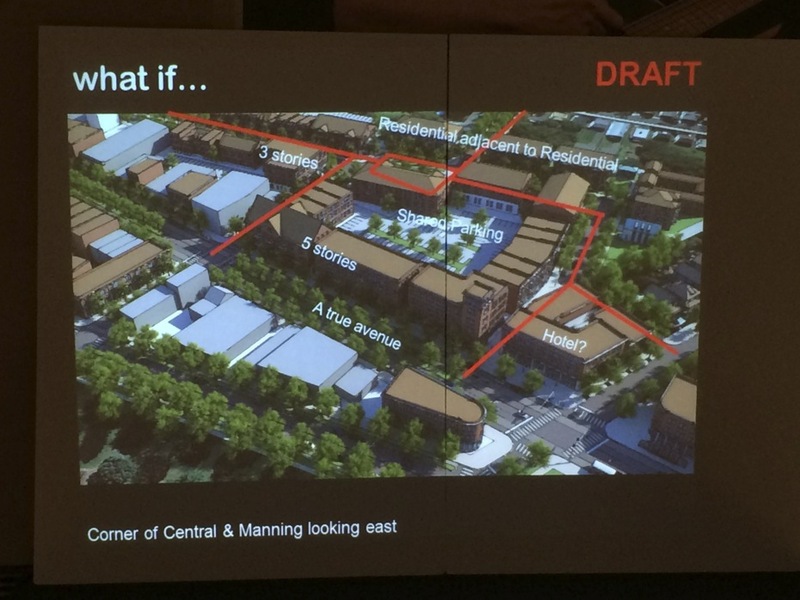 More visions of potential residential development near Central. What direction should Central Ave take? What are the possible destinations? Those questions about direction -- metaphorical rather than geographic -- were the theme of a discussion this week about the corridor's future as part of the ongoing ReZone Albany effort. 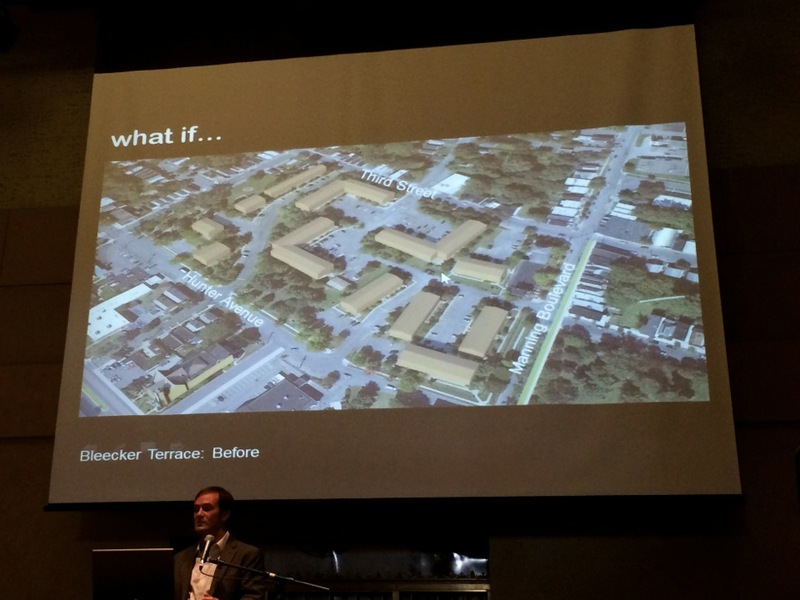 "There seems to me, from the perspective of traveling around a lot, that there is a lot of untapped economic potential in this area," Jason King, from the architecture and planning firm Dover Kohl, said about Central Ave after Wednesday's public presentation at The Linda, the culmination of a three-day intensive look at the corridor. "And I do actually think it's inevitable that it will come. And the question is when it does, what form will it take. Will it be respectful of what's here or will it be intrusive. Will it be fought or will it be integrated and appreciated." 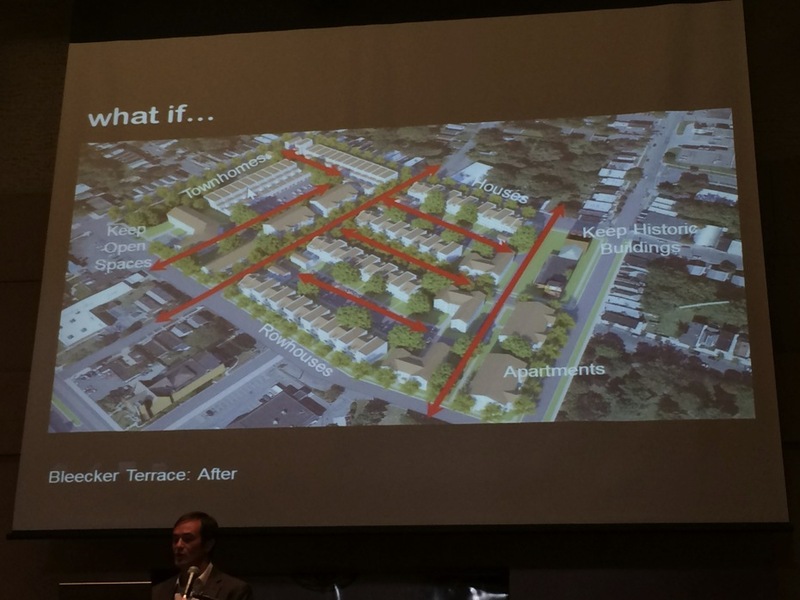 Here's a look at some of the potential visions presented for one of Albany's main arteries, along with a few thoughts. 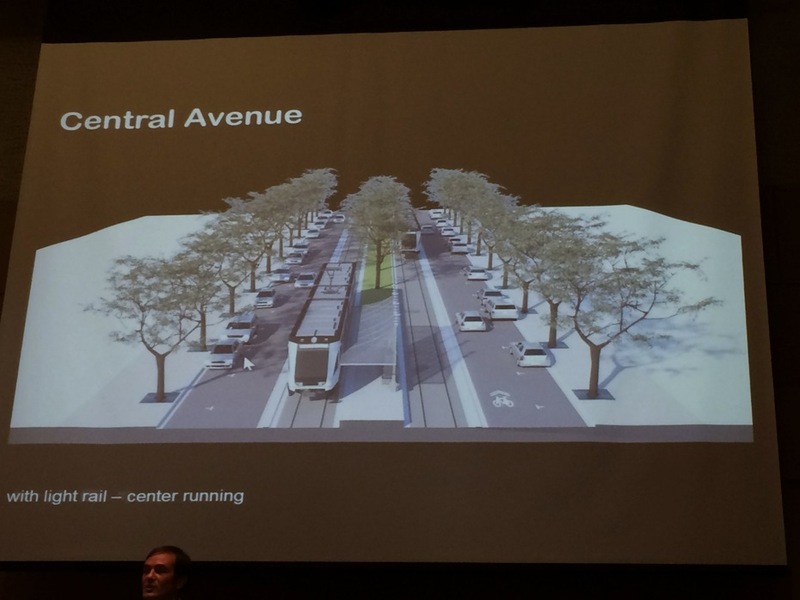 Renderings of some of the potential visions for the future Central Ave that were presented at the public meeting are above in large format -- click or scroll all the way up. 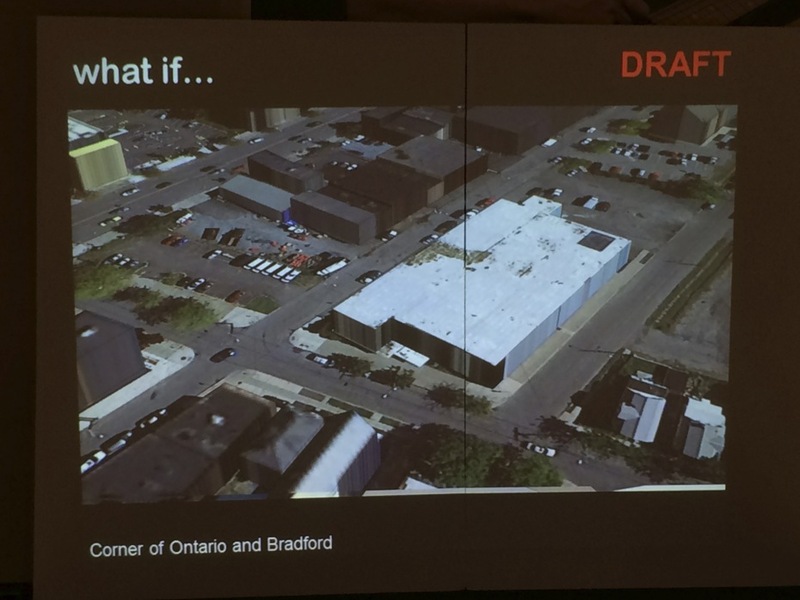 A core component of ReZone Albany project is something called "form-based code," and it's been part of the discussions for both the Warehouse District and now Central Ave. Dover Kohl is the firm that's assisting on that part of the project. So, what is it? Well, boiled down -- a lot -- form-based code is an attempt to design zoning standards with an eye toward the shape and feel of a place, rather than specifics about how it's used. "We're a lot less concerned about uses. So offices can be above houses, or houses above shops. Our concern is with the actual form of the building. 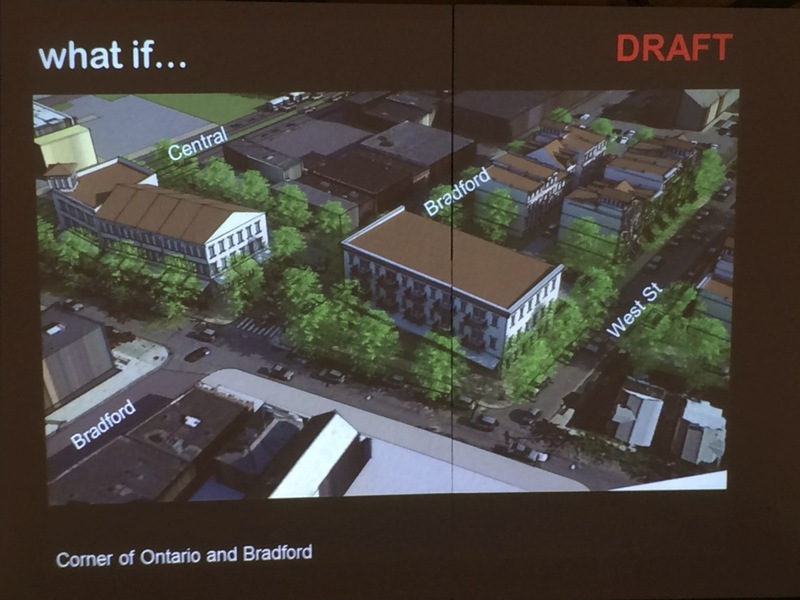 How it interacts with streets, what the pedestrian experience is like, the character of the buildings, the height is important," Jason King explained to us Wednesday. "We allow whatever to happen happen, whatever the market wants to see -- provided it follows certain rules. And the rules involve protecting and enhancing historic, walkable areas. And caring a lot more about the look and the way places work." From one perspective, form-based code is a response to the way suburban design -- of, say, a fast food location, with a big parking lot and drive-thru -- has often been dropped into a city with little regard to the surrounding built context. King travels around a lot for work. And in Central Ave he says he sees Albany's "midtown" -- an area not unlike those that have seen development in recent years just outside the downtowns of places such as Dallas, Miami, Oklahoma City, and Berkeley. In part, he says, those areas have drawn development because they're more flexible than downtowns, which are often already densely built or otherwise hard to build in. Those areas are also the beneficiaries of the larger trend involving people moving back to cities. "There are cities where it's happened faster than Albany, because the growth rate is so low. And there are parts of Albany that look more attractive right now if you're going to relocate a business or if you're going to relocate your family," King said to us. 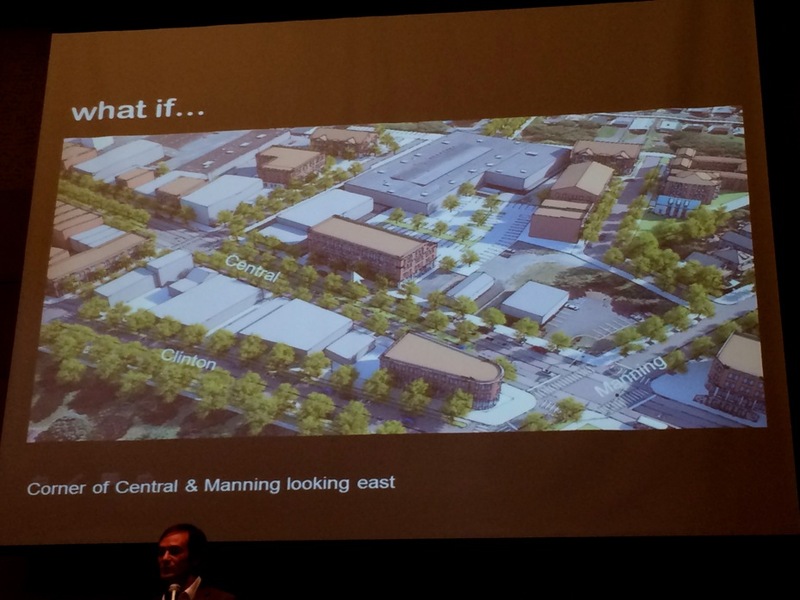 "But Central Avenue will see its turn. You're talking about global trends. It will happen. The question is the pace and what the ultimate form of it will be." The question we often have when hearing these sorts of projections is this: Where are the people going to come from? If Albany -- and other cities around the Capital Region -- is going to continue redeveloping its downtown and neighborhoods like the Warehouse District and Central Ave with new residential and mixed-use space, it's going to take people. Albany is currently a city of just about 100,000 people. Filling these areas -- along with other neighborhoods -- probably means a city of, say, 110,000 or 120,000 people. So, if that happens, are those people new to area? Are they moving from other parts of the Capital Region? What prompts that shift? 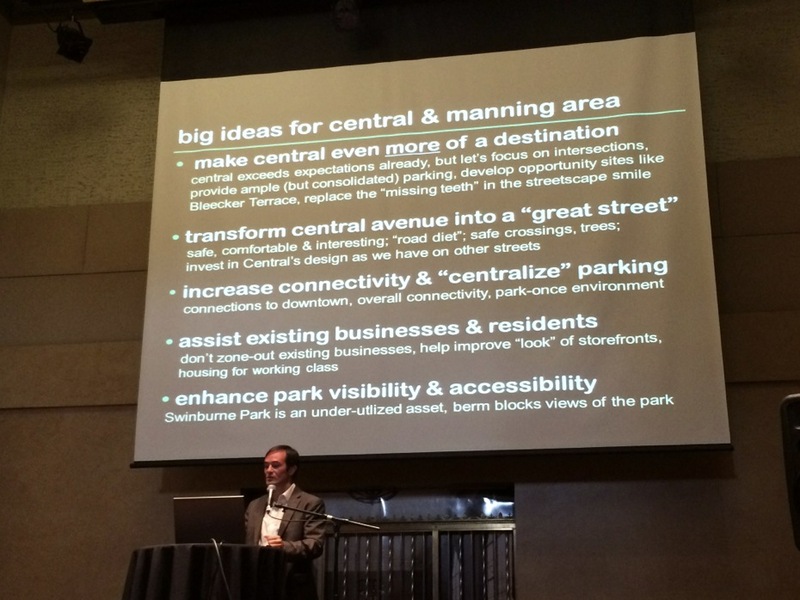 Central Ave is the sort of area that often gets overlooked in development discussions. It's not upscale. It doesn't have a lot of the old-warehouse-type architecture that's so en vogue right now for redevelopment. And for a lot of people who just pass through Albany, it's probably more known as that street where you're likely to get stuck behind someone double parking. But of any place in the city of Albany, Central Ave probably is more like the future than anywhere else. It's a glimpse of how things are changing. A few years back when we looked at the demographic characteristics of neighborhoods around the Capital Region, the census tract that includes the core chunk of the Central Ave corridor was the most racially diverse in the city. And outside of the tracts that include a lot of college students, it had the lowest median age of any tract in the city. Just walk down Central -- especially that block between Quail and Lake -- and it's easy to see how this is one of the area's most vibrantly multicultural places, with a strong immigrant presence. 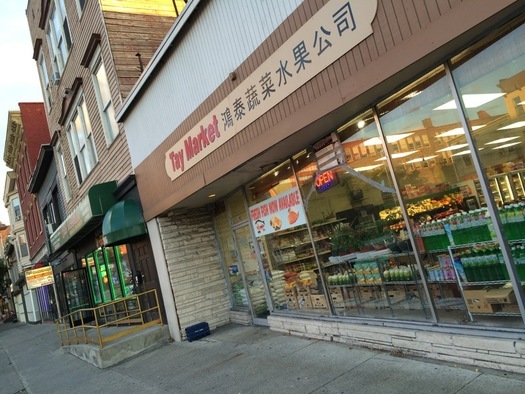 There are few spots in the Capital Region (if there are any other at all) where you're going to find an Asian market next door to a halal market next door to an African market. In some ways, Central Ave is the part of Albany that's most like the rest of the world. And that points to an interesting future -- whatever direction that future takes. Some nice ideas, but I'm a bit concerned with the "Berm" that blocks the view of Swinburne Park- that's Bleecker Stadium & it would be a shame to remove it. The Light Rail option is a nice thought (& the Avenue used to have trolleys) but is it going to supplement the bus service or replace it? I love Central Ave between Henry Johnson and Quail. It's my favorite place in the city to eat (Umana, Taiwan Noodle, Ocean Palace, Northeast Dumpling House, Casa Dominicana, Hot Spot) and to shop (Tay Market, Medina mart). It has some of the highest pedestrian and bike traffic in town (although most cyclists ride on the sidewalk because of the crazy traffic). It needs to be celebrated more. It's a place that makes Albany not boring. What direction should Central Avenue take? I'd vote for east-west but I'm open to other possibilities. "The Light Rail option is a nice thought (& the Avenue used to have trolleys) but is it going to supplement the bus service or replace it?" Neither, since it won't happen. I also wanted to say that better connections of this region with Troy, Schenectady, and other places even further could get people moving using alternative transit, I would love to be able to go to Clifton Park or Saratoga. How wonderful it would be to be able to go via light rail? The other thing is that we have the Hudson River and it seems to be an under utilized resource. The biggest thing I could say is provide connections all the way to Syracuse, Buffalo, Montreal but with destinations in between so that local people can get around. Also, I think the University at Albany operates in its' own little world. Increasing the connections would make Albany much more dynamic. David, they're already doing that (with the exception of Clifton Park, fortunately), but with buses. Light rail isn't appropriate for this area as it is now. Eventually, that will change, but until then, we still have a good transit system compared to most cities this size. Overall, with the exception of the unrealistic bits, I'm loving these plans. Not only is it great infill that seeks to incorporate a form-based code (bravo!) but there seems to be an intention to add more streets and break up some of the very large blocks, which would be a huge plus. Just the fact that this area is undergoing such heavy consideration will likely bode well for it. Hopefully it remains similar to the adjacent stretch of Central, the multicultural heaven described by Jason above.
" Neither, since it won't happen"
Improving housing and providing assistance to small businesses is probably the most realistic thing to do. It may be surprising to some people (because of the crime stories we hear on the media - some of which aren't hyped up), but the demand for housing in this neighborhood is very high. It's high because a lot of working class and lower income people do not drive, and the areas around Central provide great bus service as well as walkability to markets and stores. Unfortunately, so much of the housing is of very poor quality because of lax code enforcement and absentee landlords. But good housing is in demand. I remember reading a story some years back when the Charles Touhy foundation was building housing in Arbor HIll and West Hill. He said he couldn't keep up with demand because he could only build so much infill because of arcane issues of title - who owned the abandoned lot - the bank, the county, the individual, and all of the red tape involved? I wish I could find the link to that piece! I love what's happening right now in Sheridan Hollow with residential. Something similar should happen further up on the adjacent streets of Central Avenue. In addition, there needs to be more small business support and development through low interest or forgivable loans as well as seminars on running a small enterprise. I think Central Avenue right now is developing quite well organically in terms of the ethnic markets and restaurants. Those types of activities should be supported and not the top-down redevelopment that's happening right now in Park South. The City of Albany can barely fill potholes on Central Avenue re-development seems like a lofty goal. Focus on traffic enforcement, reduction of double parked cars, pedestrian safety, dedicated bike lanes and reducing the rampant jay walking. Do not like. No view or access to the river. Let's not "Columbus" Central Ave, okay? It's a vibrant place already for the people who are already there using it and living in it. It's not "the future" for tourists or new residents from out of area to come take over. It's a real place in the present, whatever faults someone perceives in it. Unless any development plan contains very strong provisions for affordable housing and non-displacment for retail as well as residential, it's gentrification and will have very detrimental effects. "I think Central Avenue right now is developing quite well organically in terms of the ethnic markets and restaurants." 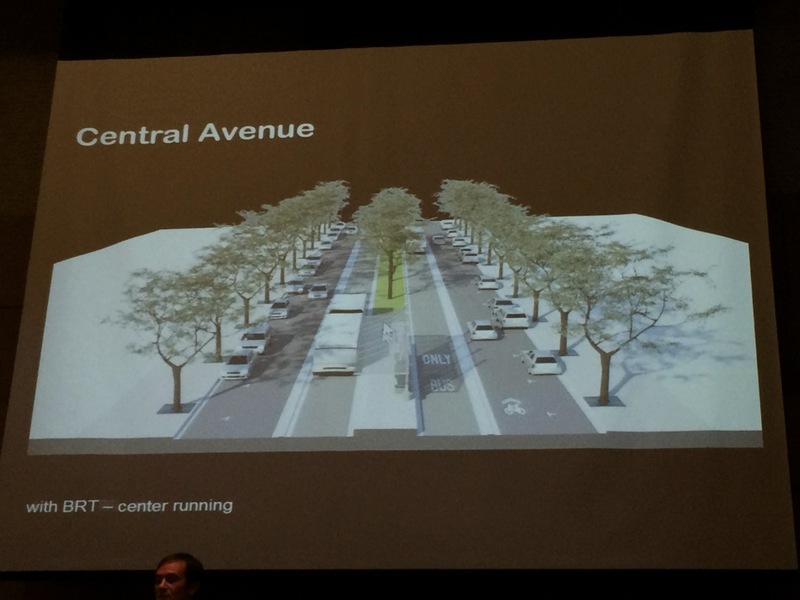 I love the idea of having separate street lanes lined with tree. I also think that the train idea/bus lane is great. We should have more bus lanes so that the buses can keep running without being in the way of traffic. Eric, I'd prefer bike lanes over more parking, since that would get more bikes off the sidewalk, which is a potentially more dangerous problem. But I'd be down with more parking if it was tucked away behind new buildings. Paul, your comment was spot on. Well put! Amy and Andy, you both made my day. Lots of insightful comments here. One thing I'd emphasize further is that Central avenue improvements should be geared to people who live on and around Central avenue. These are people who disproportionally use means of transportation other than cars to get around, including transit, bicycles and their feet. If there is going to be more parking (and I'm not convinced there need to be) it should not be at the expense of other infrastructure. Another thing: It's great to see central avenue's multiculturalism start to bleed into the Washington Park playground, where we see kids from Afghanistan, Iraq, Cambodia, Liberia, and Jamaica playing together with Albanians who have been here for generations. It is about time that the capital of a great state should transform itself into what it should be, "The Queen City of the Hudson Valley". 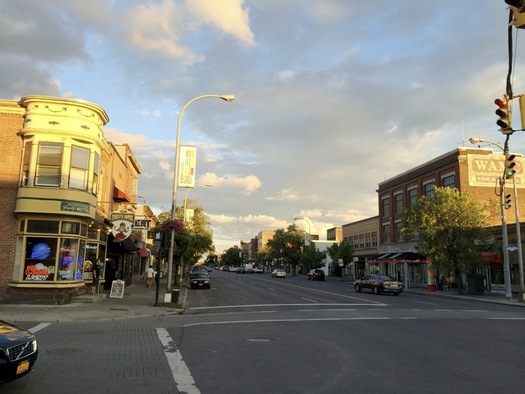 I would love to see Central Avenue transformed into a magnificent corridor from Lark St. to downtown Schenectady. Electric trains like those in Portland would be my choice. Bike lanes separated from auto traffic. Ah, the very thought of it makes me happy. Also if we could just stop building commercial projects and get an inventory of housing for all our people. A great city, with all the amenities is a people magnet. It is transformation time for the Capital District!!!! Don't hold your breath waiting for ANYTHING to happen on the Avenue, Albany meets and plans rather then actually do. If you lived here long enough you know this. Bill, this is a rezoning plan. It simply revises the zoning code to streamline the process of approval for new businesses and buildings. No one wants to continue living at Bleecker Terrace because it is a drug-infested cesspool. The walls are made of paper and one must suffer inhaling all sorts of weird chemically-treated pot or cigarette smoke. Even if you don't smoke you will test positive for pot. Tear down Bleecker Terrace! and jail the owners.